On 1 May 1915 the RMS Lusitania left from New York for Liverpool, England, on what became its final voyage. The Cunard Line passenger ship, which was at one time the world’s largest, had been in service since 1907 and had made 202 trans-Atlantic crossings – so its May 1915 voyage must have seemed routine. But it turned out to be a disaster. Photo: RMS Lusitania. Credit: George Grantham Bain; Library of Congress, Prints and Photographs Division. The Lusitania’s last voyage, taken during World War I but before the U.S. entered the conflict, was preceded by a printed warning from the German government. That public warning, made to American passengers and printed in newspapers, reminded them that a ship traveling in war zones is “liable to destruction.” It was a promise the Germans kept. On 7 May 1915 a German U-Boat fired a torpedo at the Lusitania, sinking the passenger liner off the coast of Ireland, killing 1,198 passengers and crew. Many books have been written about the Lusitania, its history, and eventual demise, but for this blog article let’s concentrate on a few heroic stories. The three passengers highlighted below represent just some of the hero stories from the Lusitania disaster but are by no means the only stories. Some stories will never be known as they were lost in the sinking along with their heroes. For me, reading the survivor testimonials of the sinking is heart wrenching. In many cases it became a case of every man (woman and child) for themselves. In contrast to the sinking of the Titanic, Lusitania passengers had less than 20 minutes to act before the ship sank – which must have increased the fear and panic for those contemplating their possible doom. Add to that level of fright the erroneous decisions and orders made by crew members believing that the ship wasn’t going to sink, and you have one of the worst maritime disasters involving civilians. It’s important to also keep in mind the time period. Those sailing on Lusitania would have been well aware of the Titanic tragedy just three years earlier. 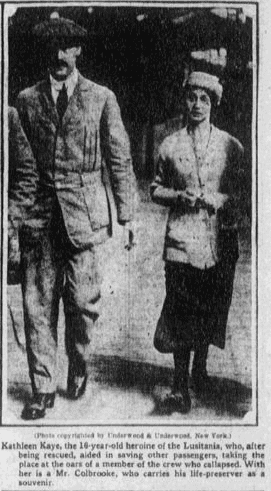 In at least one case, a male passenger gave up his life jacket to a female passenger because he believed “it might not be a very good thing to be saved and live to be accused of cowardice.”* Memories of the Titanic may have weighed heavily on those experiencing the Lusitania disaster. In both ship disasters, some passengers – in the face of almost certain death – showed a heroic concern for the welfare of others, especially for women and children. In addition to some truly horrific stories that survivors told, there were also stories of heroic self-sacrifice and kindness. Many heroes died in the tragedy, but some of those who survived were heroes in the own right. Here are the stories of three of those heroes. 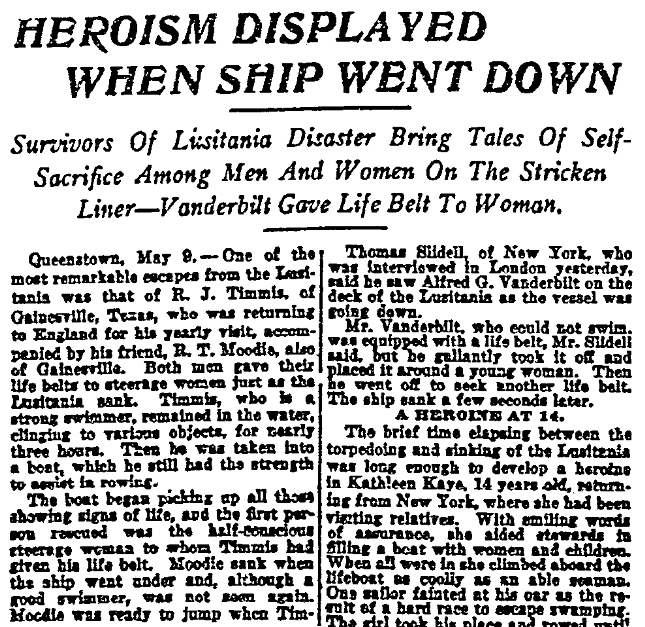 Many stories of Lusitania heroism were told of men who assisted women and children, even to the point of giving them their own lifejackets. In some cases that decision to ensure the safety of others resulted in the death of the hero, like in the case of Alfred J. Vanderbilt and R. T. Moodie. But in at least one case, that sacrificial act didn’t mean the end for the hero. Robert J. Timmis of Gainesville, Texas, was eating ice cream in the dining saloon on Lusitania when he felt the torpedo hit the ship. Eventually he and his colleague R. T. Moodie made their way to the deck where they helped with the lowering of a lifeboat. Timmis was approached by a woman, whom he gave his lifejacket to, and then a family, believed to be the Chantrys, whom he assisted. Harold Chantry, sick with tuberculosis, asked Timmis if he thought his wife Mina and baby would survive the sinking. Timmis candidly replied: “I think so, but you won’t.” The entire Chantry family would later be counted with the dead. 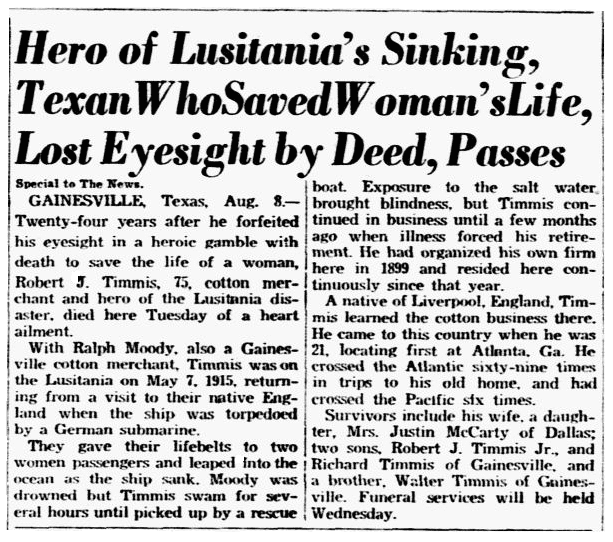 Mr. Timmis survived the Lusitania tragedy and lived for another 24 years, although exposure to the salt water during his ordeal affected his eyesight; he died in Texas in 1939. 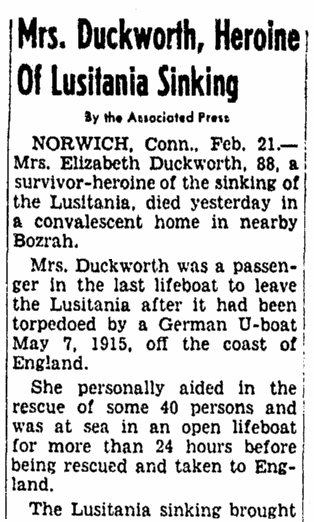 One of my favorite stories of Lusitania survivors involves Elizabeth Duckworth who, like Robert J. Timmis, was in her early 50s when she sailed aboard Lusitania in May 1915. Elizabeth was one of to the lucky ones who entered a lifeboat before the ship sank. Once Elizabeth was in a lifeboat she was set on assisting others who weren’t as fortunate. In the first instance she saw a man in the water not too far from her lifeboat and asked one of the sailors if they could stop rowing and pick the victim up. The sailor answered in the negative, to which Elizabeth replied “Yes, we can” – upon which the sailor reluctantly told those rowing to stop and they pulled the man to safety. Elizabeth Duckworth died on 20 February 1955 at the age of 88 years. Her obituary included her heroism as a last memorial to her life. 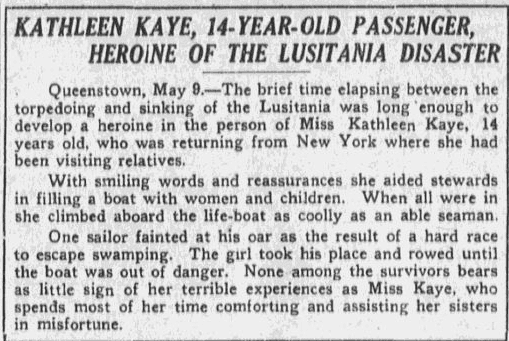 Probably one of the more remarkable stories is that of a 16-year-old girl from England named Kathleen Kaye (she is sometimes erroneously reported as being 14 years old at the time of the Lusitania disaster, but she was born 30 June 1898). Not only did she help row a lifeboat when a sailor fainted, but she continued “most of her time comforting and assisting her sisters in misfortune.” Throughout the disaster, Kathleen stayed calm, cool, and collected, helping her fellow passengers deal with the tragedy that had just befallen them. So many more stories could be told that illustrate the courage and determination of those who tried to help their fellow passengers that day in May 1915. To learn more about the Lusitania and the events surrounding the sinking, conduct a search in GenealogyBank’s Historical Newspaper Archives for the Lusitania. To narrow your search you can search just on the month May 1915. To continue your research, consider reading the books Lusitania: An Epic Tragedy by Diana Preston and Dead Wake: the Last Crossing of the Lusitania by Erik Larson. Note: An online collection of newspapers, such as GenealogyBank’s Historical Newspaper Archives, is not only a great way to learn about the lives of your ancestors – the old newspaper articles also help you understand American history and the times your ancestors lived in, and the news they talked about and read in their local papers. 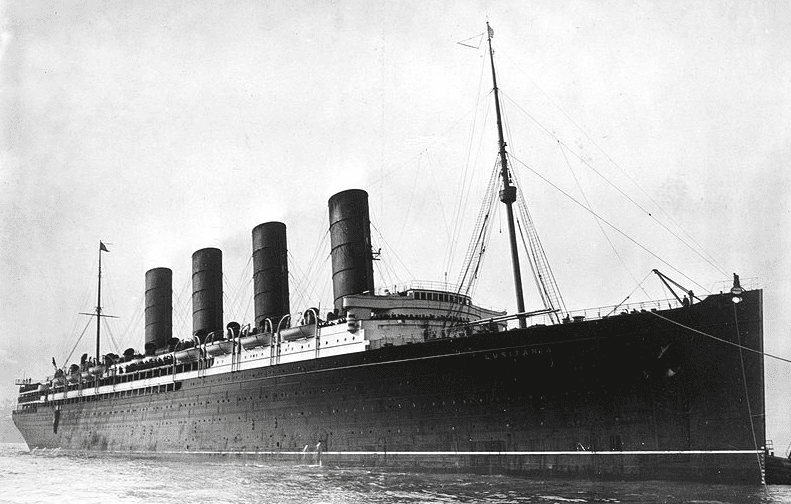 Were any of your ancestors onboard the Lusitania on its fateful voyage in May 1915? Please share your stories with us in the comments.